← I love Penang Food! My seat was right in the corner to the right of the entrance which was not cooled by the aircons at all which made it hot…very hot, and I started sweating profusely. Then the food arrived. There was an off colour Beef Rendang, jet black Ayam Buah Keluak, somewhat oily Babi Pong The (Pork), Minced deep fried prawn Fritter, Kiam Chye Ark Theng or Duck and Salted vegetable Soup, Achar, Chap Chye with glass noodles and more. I would like to say otherwise…BUT the food is rather average by my book. You see, I am a true-blue Malay speaking Baba and I must state that the BEST Nyonya Peranakan Food is cooked by true-blue Nyonyas, like my beloved Mum! There are those who rave about so-called Nyonya restuarants, and wax ever so lyrical about the food…and invariably they are NOT Nyonyas or Babas! For example, the Ayam Buah Keluak sauce although thick, did not have enough Coriander in it. Moreover it was not tangy at all. However, the stuffed minced meat and Buah Keluak inside the nut was not bad. The Chap Chye was mushy and not tasty but very bland. It reminded me of poorly cooked British canteen food during my days in University in the UK. The Achar lacked the spicy-sweet-sour flavours all good Achars must have. 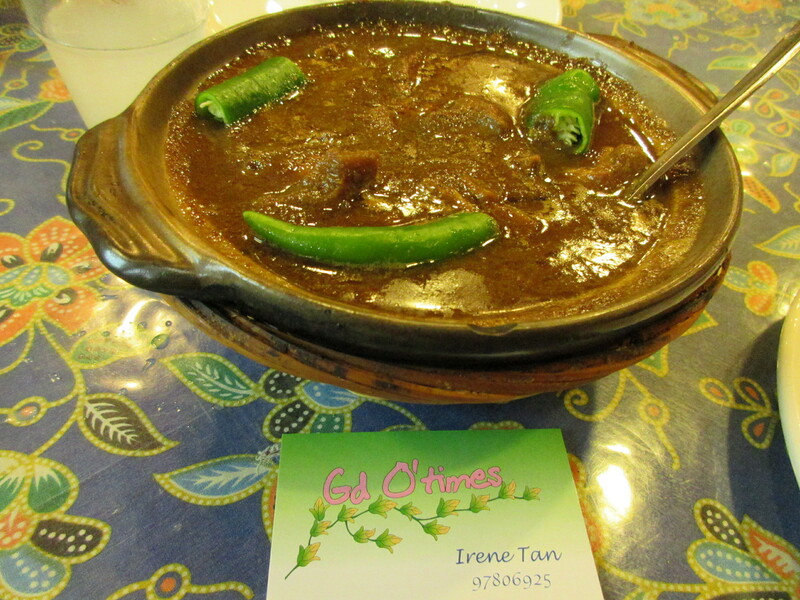 The mediocre Beef Rendang had beef that was not tender and not spicy enough, and had a weird colour to boot. It was alas a mediocre misinterpretation of the dish. The only nice thing I found was the 2013 Greek Red Table Wine served in a half bottle called Semeli. A tasteful blend of Cabernet Sauvignon and indigenous Greek Ariopritiko grape varietals. Ripe black cherry and mixed spice flavours were quite pleasing on my palate. Ambience wise, the place is small and cramped and as I have said before…very hot in the corner where I was sitting. The service leaves much to be desired…Leonard, the grumpy son of the owner, Irene Tan, is perpetually under stress with a frown and rushes about like a headless chicken. The restaurant business is a very tough business and if you cannot take the stress and still smile…you are in the wrong line. I went to meet and talk to the Chef because I wanted to see if he was a Baba.. His name is Rajan from Bangalore in India. Chef Rajan is a nice Indian gentleman. I asked him where he learned to cook Peranakan food. His reply was frank and honest. “I learned when I come to Singapore.” Chef Rajan tries hard and his food is not inedible and may please those who are not Peranakans, BUT I strongly believe that only genuine Peranakan Nyonya and Babas can cook Peranakan food with any measure of success, using the good ol’ intuitive cooking technique beloved of Nyonya Grandmas. This entry was posted in Commercialism & Hypocrisy, Food and drink, Let them eat Cake... and tagged 007, Dr. Michael Lim The Travelling Gourmet, Peranakan food Greek wine by Semeli. Bookmark the permalink.